Clickbank Affiliate Guides, Tips and More! At some stage in most affiliate’s careers they will write articles. Specifically articles for services like EzineArticles.com. Basically what these services do is offer you a targetted one way back link to your site, in return for an original piece of content. This gives you quite a few benefits, you get referal traffic from EzineArticles itself and you also get the SEO benefit that their one way targetting link provides. There are five parts to an article, title, keywords, abstract, article body and the resource box. The title is one of the most important parts of the article. It’s the first thing a user sees and also serves as the title to the article page. The first part of the title should be the keyword you are targetting with your and the second part something to entice the reader to click. An example would be Fast Weight Loss – 7 things you must know to be succesful. Put in your main keyword and a few related keywords, I’ll leave that part up to you. This is just a short description of your article that a reader will see in the article listings. It should make the reader want to read your article, without giving out too much information. Keep it short and sweet. Don’t stuff your article with keywords, this doesn’t work and will get your article submission denied. Proof Read – Check spelling and grammar. This is extremely important! Stay on topic, the article body is not a sales pitch. Like they say at EzineArticles, the body is your give and the resource box is your take – or something like that. A lot of people get caught up writing articles, but it’s best to just jump right in and have a go. Sure some of your articles in the early stages may get turned down (mine did) but you soon learn. The article body is where the main content of the article is put. The resource box is where you are allowed to put links to your site. This should be done in a specific way that I will discuss in a later post. The basic service at EzineArticles is free to sign up and use so go ahead and make an account if you haven’t already. Make sure you put a photo of yourself on your profile as it adds more credibility to your articles and will help conversions. This is where you can direct the reader to your site. I use links in the format <a href=”yoursite.com” title=”your sites keyword”>your sites keyword</a>. Search engines take into account the link text from referring links so make sure you put in your sites main keyword as the link text. That’s it, there is a lot more things to be considered when writing articles like, clickthrough rates, preselling and other more advanced tactics but I’ll save them for a later post. Before we start if you haven’t read my first post What Is Affiliate Marketing please do so now as I will assume you will know the basics of affiliate marketing. Clickbank is a marketplace for digital products. A digital product can be almost anything that isn’t a physical item. The most common product types on Clickbank are ebooks (electronic book) mostly in the PDF format. They can also take the form of website subscriptions etc, but these are less common. Anyone can become a publisher on Clickbank as long as their product is approved, so some products are better than others. Take a quick look through the Clickbank Marketplace to get an idea how things are set out. If you click on “View Pitch Page” that will take you to the products web page. It’s a good idea to take a look at a products page before you start promoting it to check that it’s a decent looking page. You will also see a link called “create hoplink”. If you click this it will bring up a window with two text boxes, Clickbank Nickname and Tracking ID (optional). Forget the tracking id for the time being. When you sign up to Clickbank you will have to select a unique username (nickname), when you enter it here it will create a link for you. If somone clicks your hoplink and buys the product you get a comission. By clicking this link Clickbank puts a Cookie on the user’s computer. This tracks your referral for 90 days, so if they buy within that 90 days you get your comission. One thing to note is that if that user visits another person hoplink your cookie will get overwritten, meaning that the last person to have their hoplink clicked will get the comission. By now if you haven’t got a Clickbank account do so now here. So just to summarize, to get your comission you need to create a hoplink for a product and refer people to that product through your hoplink. If they buy within 90 days you get your comission. Hi everyone and welcome, this is the first post of what will be many many more on the topic of making money online with affiliate marketing. 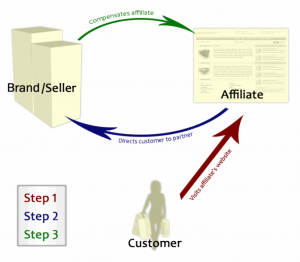 So as a first post I thought I had better explain what affiliate marketing actually is, for all those who haven’t heard of it before. This is the most common question I get from friends and family when I tell them how I make money online. Here is a small diagram that illustrates the process better than I can probably explain it. The easiest way I have learnt to explain it (and believe me I’ve had a lot of practice) is comparing it to a real world salesperson. You offer a product to a person, if they buy it you recieve a comission. Sounds simple huh? Well it is. Now the only difference between being an online salesperson and a real world one is your comission. Now if you are new to the Internet Marketing world you probably haven’t heard of clickbank.com. This is a marketplace where publishers offer their products for sale and a lot of products have up to a 75% comission on the total price! Try finding that in any sales job! I will explain the process of how clickbank works in a later post but check it out if you haven’t seen it before. I almost use Clickbank exclusively. © 2009 BleepingInternet.com. All Rights Reserved.